While celebrities often turn to Twitter to argue politics and mock religion, they did something different on Monday: they joined in unison to weep for the destruction of a church – the Cathedral of Notre Dame. The world was shocked to watch as flames consumed the cathedral in Paris, France. Constructed in 1163, the historical and cultural landmark first reached completion in 1345. The blaze, which happened during Holy Week before Easter, hit the Catholic community especially hard. But with 13 million visitors per year, the gothic wonder exemplifies how beauty – beauty dedicated to God – draws in all peoples, regardless of their politics or backgrounds. That included celebrities, from Eva Longoria and Cher to Idris Elba and Lin-Manuel Miranda. Here are 25 stars who mourned the loss of the precious cathedral. In reaction to the news, actress Elizabeth Banks (The Hunger Games) simply tweeted out a broken heart emoji. “So much history collapsing right before our eyes. Heartbroken for Notre-Dame and Paris,” singer Dua Lipa tweeted. 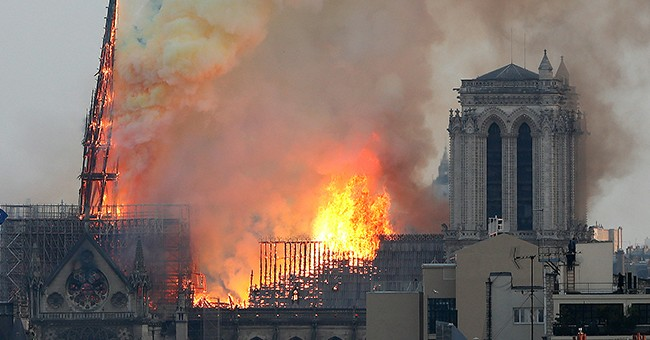 “My heart hurts watching Notre Dame Cathedral burn down,” Nyle DiMarco (Switched at Birth) typed. Gad and the others are right: Notre Dame cannot be replaced. But, with the world united, perhaps the beloved church can be rebuilt.